As November 8 nears, there have been numerous accounts of voter suppression, i.e., concerted, malicious efforts to prevent people from casting ballots. A team from The New York Times has managed to turn this sad and anti-democratic political phenomenon into an interactive video game called The Voter Suppression Trail. 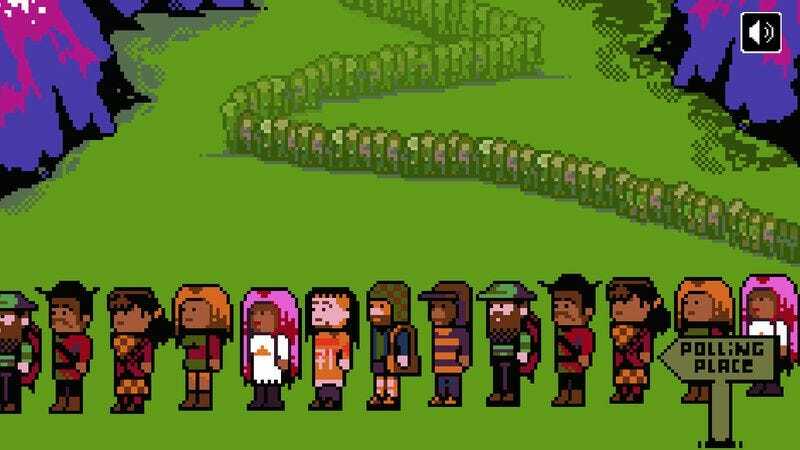 Created by Chris Baker, Brian Moore, and Mike Lacher, this fully playable game is an affectionate parody of The Oregon Trail, a classic bit of educational 1970s software that has been remade every few years since. Whereas the goal of the original game was to lead a group of settlers from Missouri to Oregon via covered wagon, the goal of this one is simply to cast a ballot in the 2016 presidential election. Should be easy, right? Not necessarily. The player has the choice of three onscreen avatars: a white programmer from California, a Latina nurse from Texas, and a black salesman from Wisconsin. You may not be surprised to hear that the programmer has little difficulty voting. There’s a well-staffed polling place within walking distance. “I could vote everyday!” he exclaims. But things are a little trickier for the nurse and the salesman, who have to endure bus rides, disputes with their employers, long lines, prowling “observers,” and much more. If voters manage to overcome all of this and cast their ballots, they are rewarded with an 8-bit rendition of “You’re A Grand Old Flag.” You can find more information on exactly what sort of gauntlet you’ll need to pass to do your civic duty by visiting this website. Good luck, everyone.